Philippe Coutinho's stunning long-range strike gave Liverpool a late victory over Stoke on the opening weekend. The match was a lacklustre Premier League encounter until the Brazilian's magic four minutes from the end. Former Liverpool man Glen Johnson could have put his new side in front in the first half, but skewed his shot over the bar from 12 yards out. Charlie Adam's long-range free-kick almost sneaked in at the back post but was pushed away by Simon Mignolet. These two sides met on the final day of last season, when Stoke's 6-1 win was Liverpool's heaviest defeat since 1963. It meant Mark Hughes' side ended the campaign with 54 points, their highest total in the top flight. Despite last season's embarrassing result, Liverpool's owners backed Brendan Rodgers and kept him as manager, so have things improved? Although victorious this time round, Liverpool have work to do on how to bed together their attacking players. Christian Benteke touched the ball just five times in the penalty area, and will need to improve as he faces competition from substitute Roberto Firmino - who had a run out in the last 15 minutes - and Danny Ings. Daniel Sturridge will add to the fight for places when he returns from injury next month. 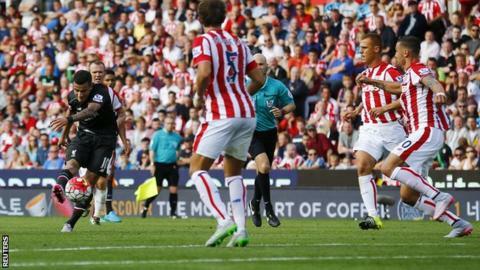 Meanwhile, Stoke are an uncompromising outfit under Mark Hughes, with new boys Ibrahim Afellay and Marco van Ginkel giving extra class to a side who were undone by a special strike. Afellay was brought in on a free transfer from Barcelona and looks to be a player who will excite the Britannia Stadium crowd. His neat footwork was generously applauded by the fans, while his composure on the ball and attacking prowess will give Stoke extra incentive in the final third. Liverpool full-backs Nathaniel Clyne and 18-year-old Joe Gomez both impressed, while the experienced James Milner and Stoke's on-loan Van Ginkel showed they are not afraid to scrap in midfield, but also looked assured in possession. Playing as a lone striker, Benteke endured a poor debut, isolated on his own, often having to drop short in search of the ball. Boss Rodgers needs to work out how to best utilise the £32.5m Belgian's height and aggression. The Reds put just six crosses into the box for him to feed off. Stoke manager Mark Hughes: "Liverpool have invested a lot of money this summer but I did not see £80m worth of difference between the teams. We are at a good level without going into the transfer market too much. "I do not think any team deserved the win, a draw would have been the fair result. We will get stronger and be more creative. In terms of the performance, as this is the first day of the season, I am quietly confident we can go on from this point." Liverpool manager Brendan Rodgers: "To get the win after what happened here last season was even more important. We showed great character and determination as a team and our quality came through. "I always felt last season's result at Stoke was a one-off. It was a poor day and it was important for us to come here and get a result. The players can put that behind them now and focus on moving forward." Mark Lawrenson on BBC Radio 5: "It's been a very drab game. Extremely dull - it's been a bit of a dog's dinner at times - but the goal was absolutely top class. The turn on Steve Sidwell was brilliant - that gave Philippe Coutinho the space to run on goal." Three of Philippe Coutinho's four goals in 2015 have come from outside the box. Match ends, Stoke City 0, Liverpool 1. Second Half ends, Stoke City 0, Liverpool 1. Christian Benteke (Liverpool) wins a free kick in the defensive half. Foul by Christian Benteke (Liverpool). Marc Muniesa (Stoke City) wins a free kick in the defensive half. Peter Odemwingie (Stoke City) wins a free kick on the left wing. Goal! Stoke City 0, Liverpool 1. Philippe Coutinho (Liverpool) right footed shot from outside the box to the top right corner. Assisted by Joseph Gomez. Corner, Stoke City. Conceded by Nathaniel Clyne. Glenn Whelan (Stoke City) wins a free kick in the attacking half. Attempt blocked. Marco Van Ginkel (Stoke City) left footed shot from the centre of the box is blocked. Assisted by Jonathan Walters. Substitution, Stoke City. Peter Odemwingie replaces Ibrahim Afellay. Attempt missed. Philippe Coutinho (Liverpool) right footed shot from outside the box is too high. Attempt saved. Martin Skrtel (Liverpool) header from the centre of the box is saved in the bottom left corner. Assisted by James Milner with a cross. Corner, Liverpool. Conceded by Philipp Wollscheid. Attempt blocked. Christian Benteke (Liverpool) right footed shot from the centre of the box is blocked. Assisted by Philippe Coutinho. Foul by Ibrahim Afellay (Stoke City). Corner, Stoke City. Conceded by Simon Mignolet. Attempt saved. Dejan Lovren (Liverpool) left footed shot from the left side of the box is saved in the centre of the goal. Assisted by Martin Skrtel. Substitution, Liverpool. Emre Can replaces Adam Lallana. Christian Benteke (Liverpool) wins a free kick in the attacking half. Offside, Stoke City. Glenn Whelan tries a through ball, but Mame Biram Diouf is caught offside.